The small towns on and near the Russian River near the California coast are some of the cutest in this part of California - and each has a distinct personality. Guerneville, the largest of the bunch, has a three-block-long main street, a historic bridge and offers the widest variety of places to stay. You'll find the town of Guerneville near the Pacific Ocean, west of Sonoma County and north of San Francisco. The area is popular with wine and food lovers. In contrast to wine-obsessed Napa, there are almost as many farm stands as tasting rooms along the wine region's back roads. Nature lovers enjoy the outdoors along the Russian River, especially the redwood forest - and the Pacific Ocean isn't far away. Bicyclists flock to the area for pleasant, mostly flat rides - but most of the roads have little or no shoulder and mixing with automobile traffic can be tough. Summer has its appeal when it's hot enough to get out and enjoy a day of water play, but the weather is best in spring and fall - and it's less crowded then, too. If you've only got a day, you can't go wrong with a walk in Armstrong Redwoods State Park (just north of Guerneville). It's less crowded than Muir Woods but just as beautiful, located in a similar forest of 300-foot-tall coastal redwoods. You'll find hiking trails for visitors of all abilities. Horseback riding is a fun way to see the redwoods. Find out how you can take a guided horseback trail ride. Go for a Rambling Drive: Follow CA Highway 116 through the redwood forest, along the Russian River toward the ocean, then north along CA Highway 1 through Bodega Bay and back inland. Lots of small side roads offer infinite variation, but try to take in Graton, home to a nice art gallery, antique shops and two terrific restaurants, Underwood's and the Willow Wood Market. Even smaller Freestone boasts Wild Flour Bread, one of the best bread bakeries anywhere, and Osmosis Spa. Take care to share the road respectfully with bicyclists, some of whom (it's sad to say) may not reciprocate. 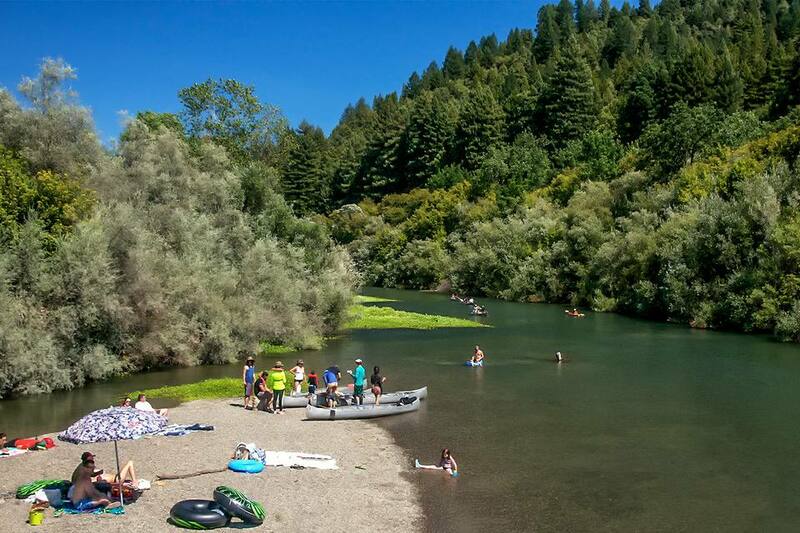 Water Play on the Russian River: Kayaking, canoeing, and swimming are popular in summer. Bring your canoe or kayak, rent one or take a guided tour from Burke's Canoe Trips or King's Sport. Go Wine Tasting: For the most part, Russian River wineries are less pretentious than their counterparts further inland. The wine appellation covers a lot of territories, and it's easy just to keep rambling up toward Healdsburg if you connect with Westside Road on the north side of the river, but instead of wearing yourself out, plan a different time for a getaway to Healdsburg. Pick up a map of the Russian River Wine Road at local businesses or on their website. We especially like sparkling winemaker Korbel for their great tour, historic property, and beautiful gardens. Get more information about Korbel on their website. Bicycling: You can use Sonoma County Bike Trails to plan your route, or stop in a local bike shop for advice. Charles Schulz Museum: The museum that honor cartoonist Charles Schulz is in Santa Rosa, which is on the way to Guerneville and an easy stop coming or going. A visit with good Ol' Charlie Brown and his creator is a must for fans of the Peanuts comic strip but better-suited to reading adults than small children. Learn more about the museum here. Guerneville is the most central place to stay if you want to enjoy the Russian River area. For help getting the best possible deal, read about how to find a good place to stay, cheap or just go straight to Tripadvisor's hotel review and price comparisons for Guerneville. Where Is the Russian River? The Russian River runs west through Sonoma County to the Pacific Ocean. The part of it covered on this page is centered around the town of Guerneville.